In the first story, Legacy of Lies, sixteen-year old Megan Tilby is sent to visit with her maternal grandmother. Megan’s mother doesn’t have the best relationship with Grandma Barnes. Megan has never seen her grandmother as a result. To help smooth things out between his wife and mother-in-law, Megan’s father has accepted Grandmother Barnes’ stiff, brief invitation to visit and it’s out of Tucson and in to Wisteria for the next two weeks. There are several reasons why Megan’s mother and grandmother don’t get along: she married outside of her race, her politics differ, and the fact that she adopted not only Megan, but two other children as well--to say Grandmother Barnes is uptight is putting it lightly. I found it strange that Megan is essentially a pawn in her family’s social agenda to gain pathos with her Grandmother and heal a rift Megan really has nothing to do with. This was even more confusing when, despite sending the invitation, her grandmother acts still as if she would rather not have Megan in her home. However, as the story unfolds I discovered there’s something more than a little strange going on in Scarborough House. Megan’s cousin, Matt, lives at Scarborough House and seems to be as agitated and disturbed by her arrival as her grandmother. He’s not so much cruel (at first) as he is dismissive and disinterested. He clearly goes out of his way to ignore his cousin. When Megan begins experiencing dreams that are weirder than usual and realizes she may be sleepwalking, she worries, especially after her grandmother accuses her of moving things around the house. Could Megan have done something in her sleep and just not remember? The only problem is confronting her grandmother about this. She seems to become even more unhinged and snappish, quick to anger and accuses Megan with each unexplained event in the house. The plot dissolves fairly easily, though, when, after so much mystery and anticipation, Chandler readily spells out that Megan has become reincarnated as her grandmother’s murdered sister. Not only is there little to no confusion over whether Megan is really just fantasizing and feeding her imagination on local ghost stories, but Chandler compounds the lack of suspense by including everyone she’s had contact with during two very long weeks in this elaborate reenactment of the past. There is a convoluted love triangle that turns into a quadrangle, a foreboding second murder and a Happily Ever After ending that I found a little too incredulous to believe. The second story, however, did well where Legacy of Lies let me down. Lauren Brandt, a Washington Senator’s daughter, has returned to Wisteria after seven years. It was there, in the Sycamore River that her mother drowned, behind her good friend, and Lauren’s godmother’s house. On the advice of her Grief Counselor, Lauren finally decides it’s time to confront her past. She arrives and explores the waterfront, seeing old childhood friends from her summers spent with her Aunt Jule (godmother) and her two daughters, Nora and Holly; in the two weeks she’s in Wisteria (like Megan) discovers there’s something more to her mother’s death than she’s ready to face. Haunted by nightmares of weird knots appearing in every day objects right before her mother’s death, she tries not to panic when she begins seeing knots everywhere--the rope swing, a lamp cord, her necklace. Not to mention Nora’s bizarre behavior and a water phobia that’s blown into something frightening and debilitating. Lauren doesn’t find it easy to find closure in Wisteria; her extended family’s weird behavior, Aunt Jule denying Nora needs psychiatric help, and the overall tension she feels from everyone who thinks she’s had the world handed to her on a silver platter make it even more difficult. The suspense I found a lacking in Legacy of Lies is stronger in Don’t Tell. I found myself actually creeped out and frightened, gripping the pages as each disturbing event brought on some of the most despicable character reactions I’ve ever read. In both of these stories, people like to make wild accusations with no evidence to support their claims. They also very rarely apologize, even when the accusations are followed or punctuated with name-calling or other hurtful statements. Aunt Jule, for example, said many reprehensible things. I was surprised when Lauren just stood there and, after one or two angry-yet-composed responses, didn’t feel the need to continue to defend herself or her mother. Several times, after arguments had occurred and time had passed, neither person apologized. Aunt Jule acted as if nothing happened; Lauren was happy the drama was over and accepted things going back to the good old ways. I thought those scenarios were unbelievable--especially because it happened in Legacy of Lies as well, between Megan and her grandmother. With so much preexisting prejudice against her granddaughter, it didn’t take much for me to accept this behavior from Grandmother Barnes. Aunt Jule, however, has been like a second mother to Megan. Her reactions and behavior were most often nasty, petty, and rude. Both characters--Grandmother Barnes and Aunt Jule--were cruel characters that ultimately proved to be sources of great comfort. The polarity of each relationship from beginning of the stories to the end, was so radical, I struggled with accepting the resolution for both. I can’t figure out if it’s the nature of the pieces--their length--that dictated the quick surprise, upside-down endings or if it’s just the way Chandler normally handles her prose. I did find myself drawn to the narrative of each story despite my frustrations, compelled to find out what happened next, but did not feel the urge to read the next installment, Dark Secrets #2. This was a quick, enjoyable read (even with the painful relationship dynamics that developed) and I would recommend it to fans of Paranormal Romances, ghost stories, or thrillers. There’s enough betrayal, double-crossing, jealousy, mystery, and of course, romance to please fans looking for an engrossing afternoon read. 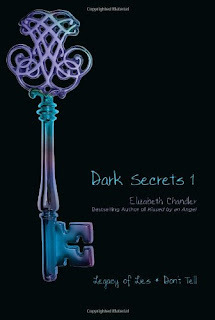 The second volume, Dark Secrets 2: No Time to Die & The Deep End of Fear comes out at the beginning of May. Thank you to Simon & Schuster UK for my review copy! This one had been waiting for a while to be read. I feel awful! The next YA on my list are Generation Dead, and Kiss of Life. ;) Teen romance + zombies.